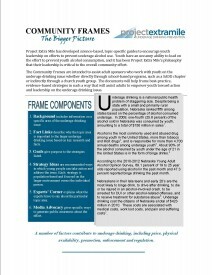 Project Extra Mile has developed science-based, topic-specific guides to encourage youth leadership on efforts to prevent underage alcohol use. Youth have an uncanny ability to lead on the effort to prevent youth alcohol consumption, and it has been Project Extra Mile’s philosophy that their leadership is critical to the overall community effort. The Community Frames are intended to assist adult sponsors who work with youth on the underage drinking issue whether directly through school-based programs, such as a SADD chapter or indirectly through a church youth group. These documents will help frame best-practice, evidence-based strategies in such a way that will assist adults to empower youth toward action and leadership on the underage drinking issue. To view our Community Frames Introduction, click on the image on the right-hand side of this page. The supporting frames on this website are based on the latest science and research.